Mexican drug lord El Chapo Testified Giving Millions to Democrat Leaders like Nancy Pelosi, Adam Schiff, and Hillary Clinton. Drug kingpin El Chapo testified that he gave MILLIONS to Pelosi, Schiff & Killary. The Feds then closed the courtroom doors. A message on social media sites claims that Mexican drug lord El Chapo Testified Giving Millions to Democrat Leaders like Nancy Pelosi, Adam Schiff, and Hillary Clinton. It also says Federals closed the courtroom doors after his testimony. Amidst the ongoing court trials of the Mexican drug lord, readers thought the message is a fact – it is not. Joaquín Archivaldo Guzmán Loera, aka ‘El Chapo‘ is a Mexican drug lord and former leader of the Criminal organization, Sinaloa Cartel. The drug cartel generated billions of dollars by smuggling tons of drugs like cocaine, heroin and methamphetamine. Guzmán became Mexico’s top drug kingpin in 2003, and he is known as “El Chapo” because of his 168 cm stature. The U.S. Department of the Treasury considered El Chapo the “most powerful drug trafficker in the world“. The Drug Enforcement Administration (DEA) considered him “the godfather of the drug world,” estimating he matched the influence and reach of Pablo Escobar. Has El Chapo Testified Giving Millions to Democrat Leaders? Lot of social media users on Facebook and Twitter have been sharing the message in question. Because of popularity of the drug lord and his case, the posts also garnered thousands of shares. 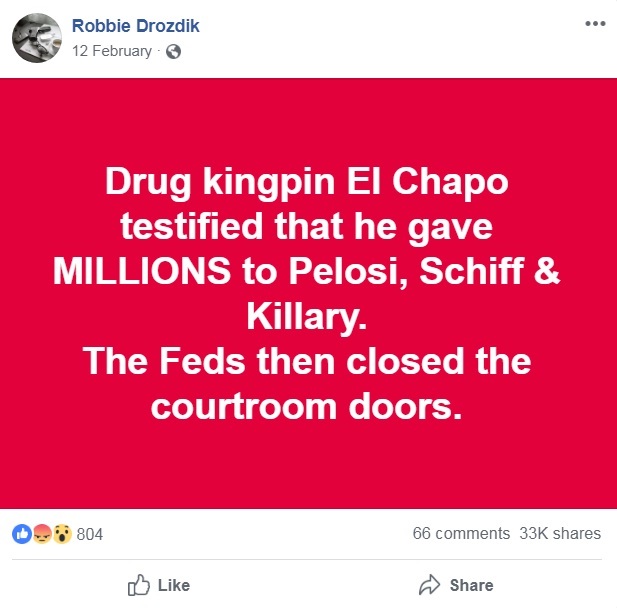 They in fact mention the drug kingpin El Chapo testified in court saying he gave Millions to Pelosi (Nancy Pelosi), Schiff (Adam Schiff) & Killary (Hillary Clinton). However, there are no credible news reports, courtroom documents or anyone related to the case supporting the claim. The message also does not cite any kind of supportive evidence. Moreover, Joaquín ‘El Chapo’ Guzmán decided not to testify in his own defense. So, the messages claiming drug lord El Chapo testified giving Millions to Democrat leaders is just a rumor that surfaced on social media. In January 2017, Mexican federal police handed over the drug lord to US custody. Court trials began in November 2018, and in February 2019, Federal jury found the drug lord Joaquín ‘El Chapo’ Guzmán guilty of all criminal counts. The drug lord may have to face life imprisonment.